I have been a residential interior designer for 20 years with a long-standing clientele from Chester County to the Jersey Shore. Projects include single room solutions to new construction and renovations. I listen carefully to my clients' needs and wants, then create a space that reflects their personal tastes and lifestyle. With a strong background in textile design and furniture, I use my experience to create rooms that are warm and comfortable, balanced in color, and functional. 10% off Window Treatments for Houzzers! *Hunter Douglas Authorized Dealer* Ambiance Design is a locally-owned and operated window treatment company servicing Bucks County, Montgomery County, and the greater Philadelphia area. We provide quality window shades, blinds, interior shutters, draperies, and other design solutions for homeowners, contractors, and designers. Our experienced, professionally-trained team is led by owner Laura Hawley, who gained her expertise of Hunter Douglas products through her previous role as a Product Manager and Installation Service Field Manager at Hunter Douglas. Laura founded Ambiance Design in 2008. Over the 8+ years of operation, the company has quickly grown to become one of the top-trusted window fashion businesses in the local area. The team at Ambiance Design is dedicated to providing exceptional, personalized service, with a long-term commitment to the local community. We are here to help with your window covering and design needs now, and will be here for many years to come. Ambiance Design carries all the beautiful products of Hunter Douglas, and can also handle your needs for draperies, bedding, and wallpaper. We offer the convenience of in-home design consultations, where you can shop for the perfect window coverings and design solutions from the comfort of your own home. Our team brings unmatched expertise, to simplify the often-complex process of choosing and installing the perfect window treatment products that will bring out the beauty of your space. Whether you are a designer looking for ideas on a difficult project, or a homeowner seeking guidance on design solutions to fit your taste and budget, our team has the knowledge and experience you need. From stunning new window shutters to hard-wired motorized shades, we can help you find the perfect products and provide expert installation for a new look that's built to last. We encourage you to visit our expansive showroom in Blue Bell, PA, located at The Shoppes at Village Square. Our showroom contains working displays of our entire Hunter Douglas product line, along with the latest designs in quality curtains, drapes, bedding and wall coverings. Make an appointment to visit us, and you can visualize all the possibilities and discuss your interior design needs with our knowledgeable team. Call us today at (267) 898-0200 for your window treatment needs. A WWII veteran, Robert Rosen started his business in 1947. Now in its second generation, Rosen Interiors has been a family business for over 67 years and remains a staple of the Home Decorating Industry in the Delaware Valley. From one window to the whole house, no matter the size of your project, we can help you make the best selections to suit your needs. Rosen Interiors is one of the leading providers of Custom Window Treatments, Upholstery, Slipcovers, Color Consultations & Interior Decoration to the greater Philadelphia area. All of our products are fabricated in the USA and we stand by every product we sell. Please call us today for a free in-home estimate! JB Designs was founded by Jane Bradshaw in January of 2000, who years earlier naturally fell into the process of making window treatments for herself as well as family and friends through her love of fabrics and her passion to make her house her home. Window Treatments are a passion of hers, and she finds it very rewarding when her customers can get as excited about the choices they make for their homes as she does! The design process begins with a phone consultation to determine the customer's needs and wants for their home. It is followed up with an in home visit where samples or fabrics, blinds, and shutters are seen and compared. Once a design is agreed on JB Designs oversees the ordering of products, the fabrication and the installation. *Hunter Douglas Authorized Dealer* Window Concepts is your one-stop source for all your interior design and home décor needs, including custom window shades, shutters, draperies, curtains and more. 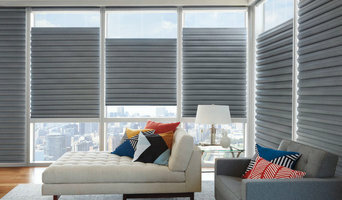 We carry the widest variety of Hunter Douglas window fashions including customer favorites such as Duette® Honeycomb Shades, Silhouette® Window Shadings, and Luminette® Privacy Sheers, with hundreds of choices for color, texture, fabric and function. And they are all made right here in the USA! Choosing the right window solution can be very complex but shouldn't be overwhelming. Whether you want custom draperies, blinds, shades, upholstery or bedding, we'll help you find styles and fabrics that fit your personality. Our experienced design professionals will work with you to find a solution that looks great and provides the privacy and light control you need. Once you’ve made your selection, our measuring and installation experts will come to your home to ensure a perfect fit for your new window coverings. Window Concepts has been turning personal spaces into remarkable places since 1990 and we are committed to your complete satisfaction. LOOKING FROM AFAR? We love to partner with out of town designers to fully manage window treatments and bedding on projects in Philadelphia, Wilmington and the surrounding suburbs! By working with the top interior designers and residents in the Philadelphia and Wilmington regions for 15 years, we are able to carefully manage the nuances of luxury fabrics and designs. We are a family owned and operated window treatment workroom and we provide custom window treatments, shades, blinds, bedding and pillows. While we staff a team of expert seamstresses and installers, the owner is an always present liaison to ensure that the details and demands of every job are successfully executed. Call us to discuss your needs! 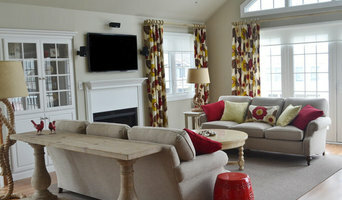 In the Fringe specializes in design, fabrication, and installation of custom window treatments and soft furnishings. Details are important to us on every level of design & customer service. Our creative workspace, located at 1306 Edgewood Rd. Havertown, houses 3 industrial sewing machines and 2 large cutting tables. This space serves as both showroom and atelier. Our custom products include quality finishing techniques that set them apart from the ready-made market. We are meticulous about quality construction and our products contain many couture details. In the Fringe has been in business for 10 years with experience in the textile, fashion & home décor industries. We offer in-home consultations. Together, let's explore how we can enhance your experience of home through the use of designer fabrics, trims & customized details! Material Girl specializes in window treatments, custom bedding, manual and automated blinds, shades and plantation shutters. Design guru Bonnie Simmons has 20 years of experience in home decor and design and loves helping clients make the best selections to add value and beauty to their home or office. Material Girl prides itself on attention to detail and competitive pricing. Clients are able to take advantage of the complimentary shop at home service, measurement, installation, and the availability of quick shipping. Named in 2018 as one of the BEST WINDOW TREATMENT COMPANIES IN PHILADELPHIA- Urban Loft Window Treatments is a full service window treatment studio creating stylish interiors in Philadelphia, the Main Line + Boca Raton, FL. Lead Designer Claudia Clobes Yudis' beautifully curated resource library combined with her fresh + modern aesthetic has distinguished her as a leader in the window treatment industry. Urban Loft collaborates with interior designers and architects and cultivates private clients locally and nationally. Since 1914, family owned and operated serving the Mid-Atlantic region with the best service, lowest prices and the highest quality products in the flooring and window covering business. We are committed to making you smile every time you walk into your house. We are not a giant big box store and we put our history, reputation, associates and installers on the line every day to earn your business. At our Wilmington design center or in your home, we provide expert design consultation along with professional installation to make your home of office beautiful. Sew Stylish Designs Llc is located in Mt. Laurel, and offers unique custom drapery, blinds and shades. 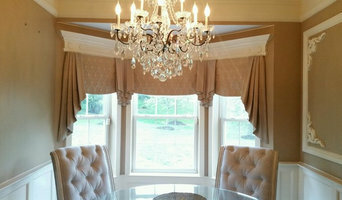 We specialize in design, fabrication and installation of custom window treatment and serve the South Jersey area. Best of Houzz 2015-2018 in customer service. Best of Home & Garden 2016, South Jersey Magazine. Best of House & Home 2016-17, House&Home Magazine. Selvin Glass enjoys visiting potential clients homes or businesses to discuss the possibilities of using glass and lighting in ways that complement your home. We want to help you realize the full potential of your surroundings. We are dedicated glass restoration professionals and are employed by churches to bring their windows back to their original glory. Selvin Glass enjoys working closely with architects and designers on new spaces. For over 27 years we have been offering window tinting service as a 3M authorized dealer to help consumers protect their belongings by applying a UV protective film, we also carry solar films to help reduce heat and annoying glare in your home or office. Privacy films for bathrooms and garages. Security films to slow down intruders and decorative films for the consumer who is looking for a little bit of a decorative look in their film.